The Barrasford Arms can secure guests Salmon & Trout Fishing on the North Tyne river, England's most prolific river for salmon fishing. We recommend the fishing to be booked through FishPal. If required we can organise a Ghillie for your fishing trip. Please get in touch to organise this with comes with an experienced ghillie and qualified spey cast instructor. 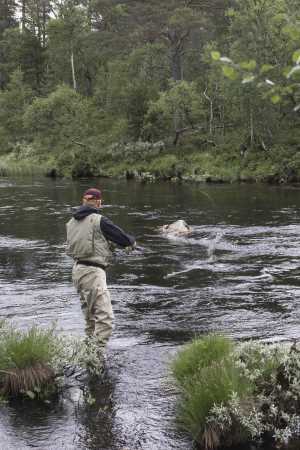 The beat is suitable for both fly fishing and spinning and is widely regarded as one of the finest stretches of water in the area. Guests can enjoy a delicious breakfast before enjoying a day fishing England's finest river in pursuit of the Atalantic Salmon, the most prized catch in the British Isles. The autumn run of silver fish fresh from the North Sea is an opportunity not to be missed and opportunities to fish the beat are limited. If you are a beginner then why not learn to fish in the beautiful surroundings of the river North Tyne under the guidance of an acclaimed instructor who will teach you how to perfect the famous spey case. For more experienced anglers the experienced ghillie will be invalauble to help you pick out the best lies where the salmon await your fly. If trout is your preferred prey then the river North Tyne offers plentiful stocks of sizable wild Brown Trout and a delightful run of Sea Trout throughout the summer months. If you are interested please contact us for more information.